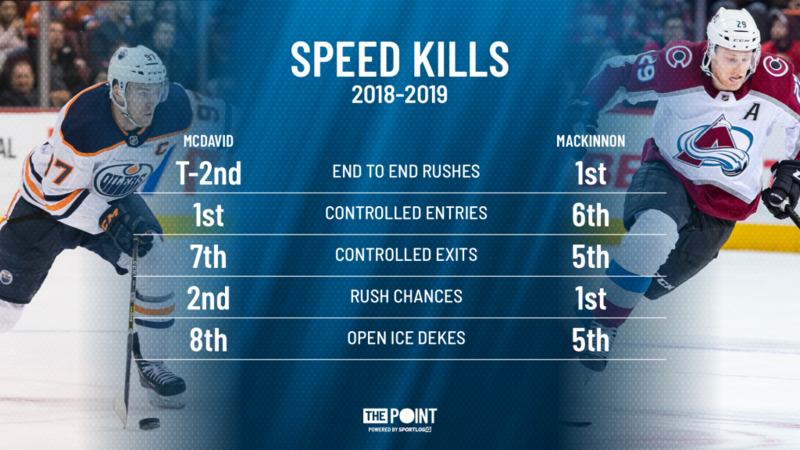 Tonight: McDavid vs MacKinnon - Don't Blink - The Point Data-driven hockey storytelling that gets right to the point. 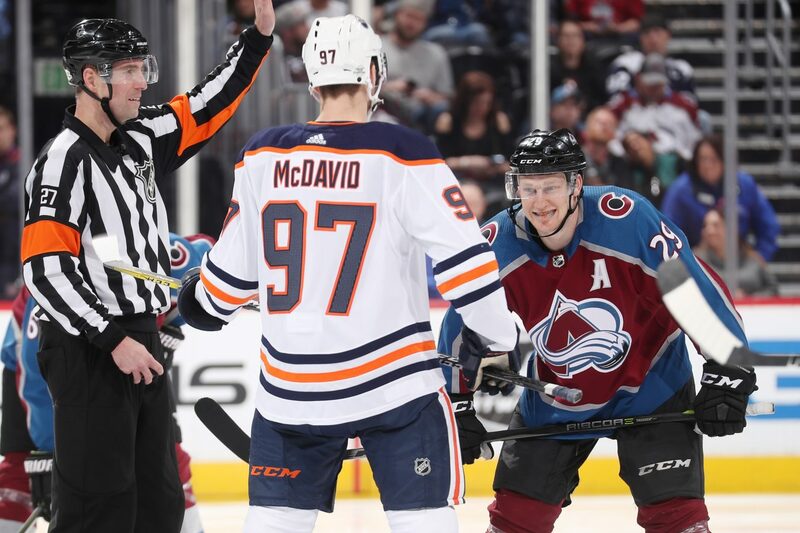 Two of the fastest players in the world go head-to-head tonight as Connor McDavid and the Oilers take on Nathan MacKinnon and the Avalanche. Both teams are playing great hockey right now with identical 7-2-1 records over their last ten games. 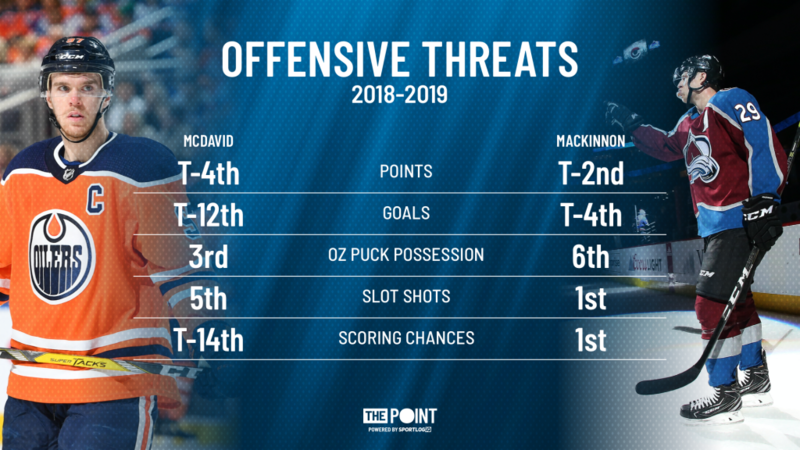 McDavid and MacKinnon are two of the most dangerous players in the league. They create using their speed, but unlike most players, their hands and brains move just as fast as their feet. They use the defensive zone as a starting block where they’re able to explode into the neutral zone at top speed forcing defenders back on their heels as they come flying into the offensive zone. Over 50 percent of even-strength goals that come as a result of an entry occurs within 5 seconds, which plays right into McDavid and MacKinnon’s skill-set. Once in the offensive zone, they’re able to use the space they’ve given themselves with their speed to create high-end scoring chances. They have an abundance of patience with the puck and are willing to hold onto it until the play develops around them to find the right opening to attack. Both players have unbelievable hockey sense and can find the smallest opening in the defense. When they see a crack in the defense they make them pay by driving play through the slot which is the most high-danger area of the ice. The biggest key to this game will be clogging up the neutral zone to take away McDavid and MacKinnon’s speed. It sounds like a simple solution but when the two of these guys get going they’re almost impossible to stop. If you’re watching the game tonight, don’t blink when these guys are on the ice or you might miss some McDavid / MacKinnon magic.